#CookoutWeek is here again! I had such a great time participating in the event last year that I knew I wanted to join up this year. 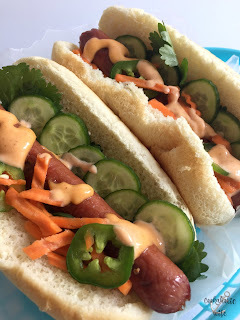 As a kid, I used to eat plain hot dogs cold, a concept that as an adult makes me shudder. Ick. I’m still not a fan of them on a bun because I feel like the bread to meat ratio is never properly met and I do enjoy them served with less common toppings. Mustard will do if there isn’t anything else, but I’ll pass on the ketchup, relish and onions. 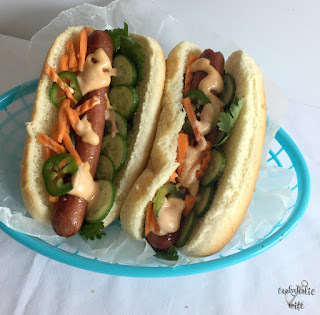 I like the more unusual toppings and when I saw a recipe using bahn mi ingredients on a hot dog, I immediately knew I needed to try it. 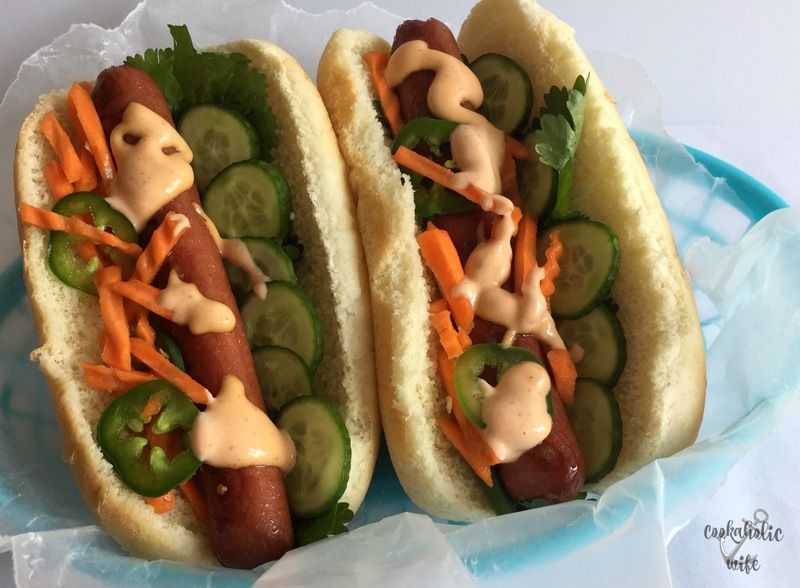 Standard bahn mi ingredients are pickled carrots, cucumber slices, fresh cilantro and sliced jalapenos. I prefer to pickle the jalapeno as well, which I did for this recipe. The hot dog takes an Vietnamese twist being topped with pickled vegetables and a spicy sauce. 1. Heat a grill to medium high heat. 2. While the grill is heating, combine mayonnaise and sriracha together to your desired level of spiciness and refrigerate until ready to use. 3. In a small bowl, whisk together the vinegar, water and sugar. Add carrots and jalapeno slices and stir to combine. Set aside until ready to use. 4. Grill hot dogs for 3-4 minutes on each side or until cooked through. 5. Add cilantro and cucumber to the bun. Place the hot dog in the center and top with the pickled carrots and jalapenos. 6. Drizzle sriracha mayo on top and enjoy. What is your favorite way to dress a hot dog? Love this riff on a common summer staple.